Odourless fish oil based chrome stable fatliquor. Appearance : Slightly viscous light brown emulsion. Chemical Type : Sulphited high quality fish oil. Ionic charge : Anionic in nature. Stability : Stable to acid, alkali, salt and mineral tanning agents. Popsynthoil LF-10 is an all purpose anionic fat liquor for high degree of softness suitable for chrome and Semi Chrome as well as for vegetable tanned leathers. 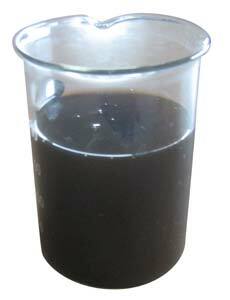 It is easily emulsifiable in water at normal temperature. Leather treated with Popsynthoil LF-10 not only possesses softness and . suppleness, but also, good tensile strength and water resistance. It imparts instant softness without high fat addition to the leather when it is partly incorporated in neutralization. We recommend 0.5-2.0% Popsynthoil LF-10 in neutralization, depending upon the degree of softness required. Popsynthoil LF-10 can also be used in rechroming prior to the addition of chrome powder to get extra softness and better chrome exhaustion. It has inherent properties, to open leather fibres and to. produce a fluffy, soft and round leather. Popsynthoil LF-10 has no effect on aniline dyes. It is satisfactorily fast to light and does not impart any yellowing to leather under normal conditions. Due to its excellent versatile properties, it can be used on a wide variety of leathers e.g. lining, upper, softies, upholstery, nappa, glove, clothing, etc. To avail its maximum efficacy to achieve desired softness, we recommend Popsynthoil LF-10 to be used stage wise i.e. in re-chroming, neutralization as well as in main fat liquoring. Storage should be away from extreme conditions wherever possible. Under extreme climatic conditions this product may separate slightly. So it should always be well stirred immediately prior to use.